If you are new here, welcome! Thanks for stopping by for my One Room Challenge. 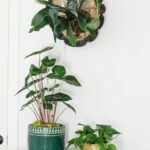 I am Leslie, creative junkie and lover of DIY and room makeovers. Sometimes there is a price to pay for having your nose to the grindstone. You see, I had told myself I was definitely up for doing the One Room Challenge this fall. I loved being part of this kind of crazy event earlier this spring! I even thought I had marked my calendar and in discussions about the blog recently with my bestie, I even planned what room I wanted to makeover. And it wasn’t going to be the master bathroom. Nope, I knew that room would have already been scratched off the list! But then, somehow, as things tend to do, the whole thing snuck up on me. I find myself at the start of another One Room Challenge™ and thankfully, kind of, we’ve really only just barely begun the bathroom remodel. We have had delays in securing key elements and general scheduling. I kind of feel like the stars have aligned and it’s only fitting that I should document this room makeover with the rest of the participants. And y’all this is such a thrill to be part of. Quite honestly, if I hadn’t gotten just a bit of a head start, I don’t think it would be wise to take the challenge. With the scope of work we are doing in this room, it could have been a disastrous ride for us to take. 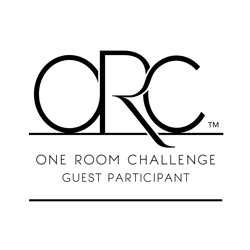 If you are new to the One Room Challenge™, here’s how it works. 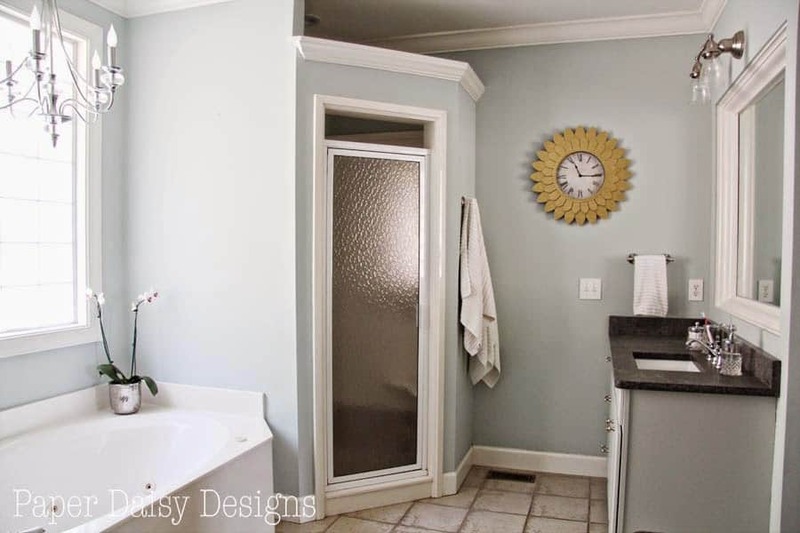 For the next 6 Thursdays you will track along with me during the remodel of my master bathroom, start to finish. I share the good, the bad, the ugly and ultimately on November 12th, the reveal of the beautiful results. And the best part is there will be a whole slew of design bloggers playing along too. It should be noted that we are all a bit crazy to take on such a challenge. Let’s take a look at where the bathroom started. This is what the master bathroom looked like soon after we moved in. 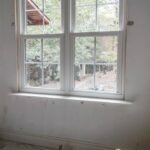 Note that the previous owner left salmon colored shutters on the walls. Nice. And don’t you love my photo bomber? Here’s what the bathroom looked like in Phase 1 of the remodel last year. This was just really a cosmetic, hold-you-over, the sinks-were-cracked-and-had-to-be-replaced kind of makeover. The power of paint is evident here. That alone makes a huge difference. 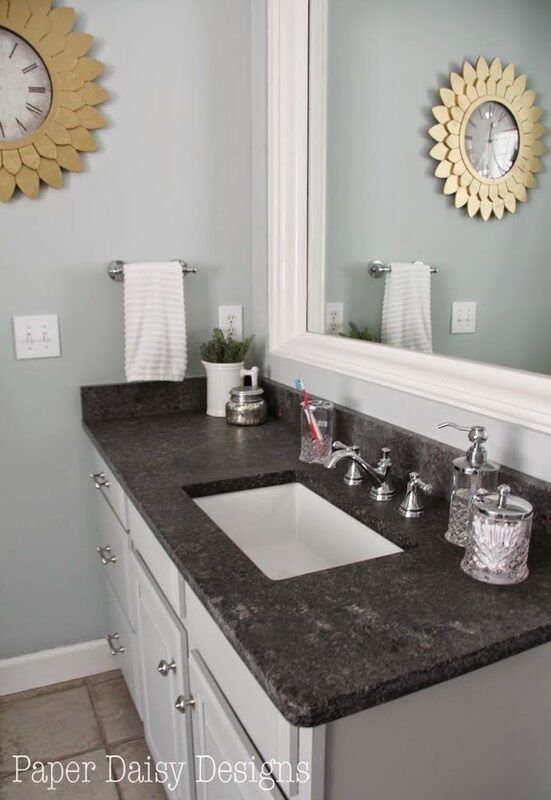 And yes, the new granite remnant countertops and streamlined sinks helped. But, we were still left standing in puddles during showers and a oversized jetted tub that I would rather not bathe in. Nothing about it felt right. It was just too big and while I cleaned it, it never seemed clean enough. Obviously, the new counters will be staying, but not much else. I shared some beautiful marble bathroom inspiration photos earlier this week. See those here. Now, I’d like to share a design board. I can’t wait to share this project with you all and I hope you will enjoy keeping up with the progress. 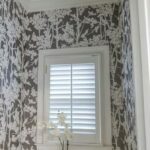 I have a few design tricks up my sleeve and hopefully some solutions for common bathroom dilemmas. Thank you to Linda, at Calling it Home for hosting this awesome event! Be sure to check out the other bloggers participating here. Oh that tub! It’s going to be amazing!! Can’t wait to follow along, good luck! This is going to be a beautifully elegant bathroom- can’t wait to follow along! Thank you, Christine, that is the hope! 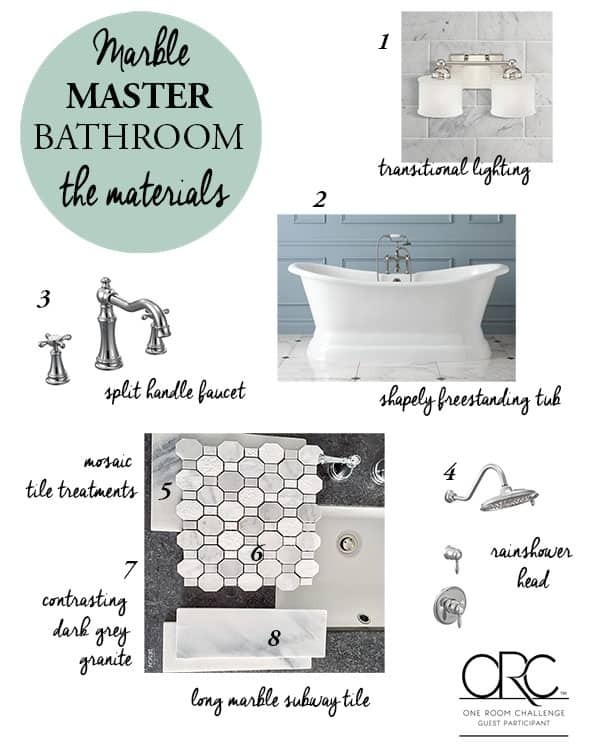 We have such similar tastes when it comes to bathrooms, which means I love where you’re going with this! I can’t wait to follow along! Iris, so happy to have another marble lover in the crowd. I can’t wait for it to all unfold. 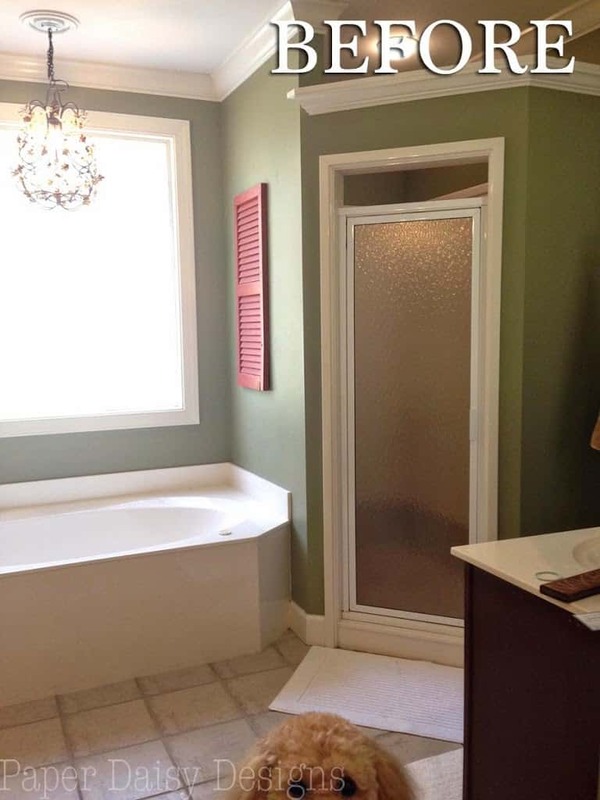 I love your design board and that bathtub, so jealous! I wish we could rip ours out but it’s not in the plans right now. 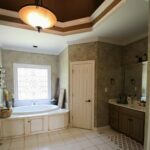 Looking forward to doing our master bathrooms together over the next 6 weeks! I’m off to follow you on instagram! 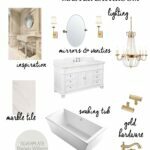 Where did you find the chandelier above the tub?! I love it! So simple and so elegant! It was from Home Depot if you can believe that! Home Decorators Collection. I purchased it on clearance so I believe it is no longer in production. Sorry! Beautiful! Just beautiful! Perfect pieces, how ever did you narrow your choices? There are so many to choose from out there! Love the paint color too! What brand & color name? Thanks so much for sharing. Honestly, budget narrows many of my choices for me. The wall color is Deep Sea Dive from Sherwin Williams. Thank you for commenting!